Lac Water Varnish is a natural resin varnish that can be used as a fixative on watercolor and tempera painting to isolate painting layers, in glazing techniques and to enhance color saturation. It can also be used to reduce the absorbency of traditional gesso and chalk grounds. It is based on a recipe used by watercolorists of the 19th century. 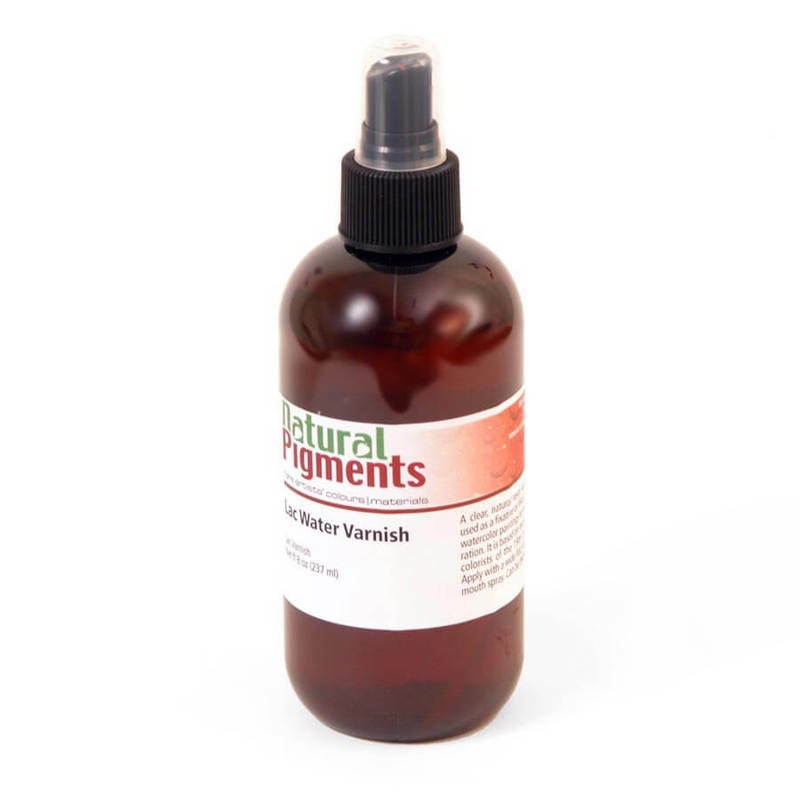 Can be used in combination with the Crystal Water Varnish to "fix" the paint layer before applying Crystal Water Varnish. Contains natural ingredients. Does not contain organic solvents. Can be thinned with water. Clean brushes with warm water after using this product. If Lac Water Varnish dries on brushes, it can be removed by soaking brushes in household ammonia. To ensure desired results, always make a test piece for your particular application and surface. Watercolor Paintings: Allow to dry thoroughly (typically overnight, depending on the thickness of paint). Tempera Paintings: Allow to dry thoroughly (typically 1-3 days, depending on the thickness of paint). Gesso and Chalk Grounds: Allow to dry thoroughly (typically overnight). Apply with a wide flat, soft-hair brush or spray on with an atomizer. Brush Application: Lightly spray onto the surface using the pump spray or with a brush. Wet the surface evenly by gently spreading the varnish over the area to be covered. Brush gently to avoid disturbing the underlying paint. Allow to dry thoroughly before applying another coat. Spray Application: Spray a fine mist over the surface with an atomizer. Allow to dry thoroughly before applying another coat.